First, let’s clarify the idea. Today, semantic search reigns, as well as high-quality content, and great user experience. Search engines focus on topical relevance instead of matching queries to exact keywords. So as a concept for ranking improvement keyword density has long died. However, if we get a new angle on it as a part of a more complex process of content analysis, it may still help SEO. How? As we strive for producing highly valuable and relevant content, we still want to rank for certain keywords. So balancing on what to consider good optimization, it’s quite logical to make sure that target keywords are not just sufficiently arranged across our page but look natural there and are not overused. And here come two options. The simplest way is to turn to an old good keyword density checker and calculate how often a keyword is repeated on a page. There’s a more complex process that implies examining how often a keyword is used on a web page compared to how often it is averagely used on a bigger set of alike pages across the web. Thus, it clarifies the keyword’s topical relevance. I’m talking about TF-IDF (term frequency-inverse document frequency), a method already used by search engines – particularly Google – for information retrieval and indexing. Most of the tools I gathered below possess this latter extremely useful feature; however, I added a couple of simpler keyword density checkers. WebSite Auditor is a comprehensive website analyzing tool. It checks your site for technical and optimization issues page by page, explains those issues to you and suggests the necessary corrections. The TF-IDF tool built in WebSite Auditor analyzes the content of your chosen web pages to help you improve their topical relevance. The tool looks through the top 10 websites competing with your site for the target keywords and collects the most relevant keywords and phrases they use in common. Based on this analysis, the tool suggests you to include certain key phrases into your content, as well as increase or decrease the use of certain keywords in your texts. The tool allows you to optimize your pages right from its interface. The TF-IDF tool is available in both the free and paid versions of the software. Price: paid plans start at $124.75 per license. Download the free edition here. Ryte is website audit software that allows for monitoring, analyzing, and optimizing the key elements of your website. Ryte’s Content Success tool utilizes TF-IDF to give you keyword recommendations based on top ranking websites across the major search engines, as well as shows you how those keywords are used by your competitors. 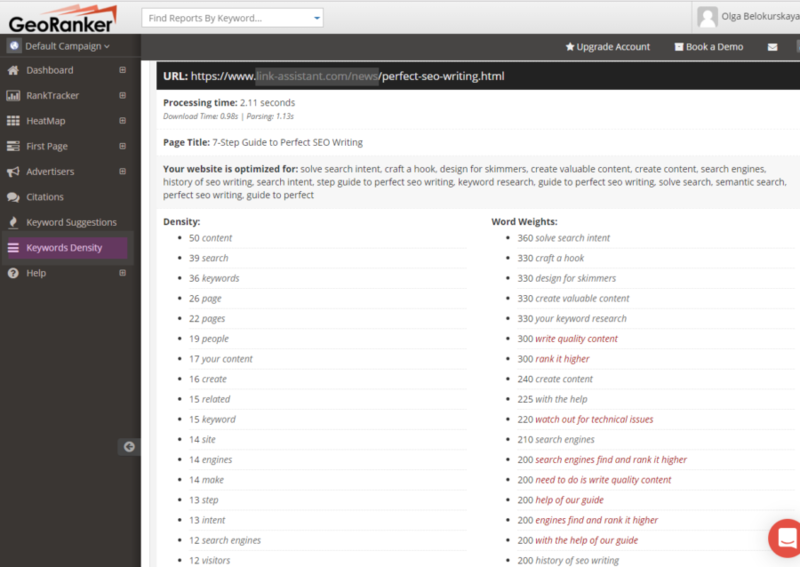 It also analyzes and optimizes your written content suggesting relevant key phrases in the Content Editor mode. Price: paid plans start at $107.91/mo. Sign up for a free copy here. Seobility is SEO checker for website analysis and optimization. It monitors your site pages and reports those having technical errors, as well as on-page SEO and content issues. 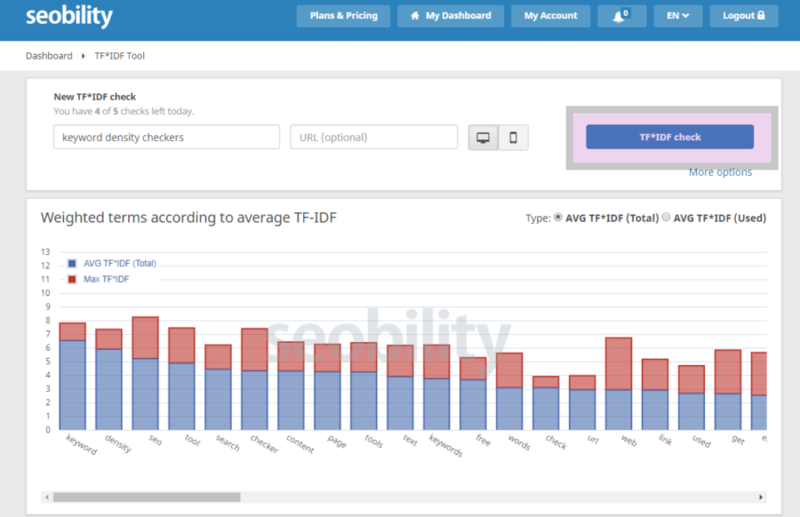 Seobility offers a free stand-alone TF-IDF checker, which analyzes and suggests improvements for the existing content of your web pages. It also lets you create new quality texts of high topical relevance. Based on the target keyword you input for a check, the tool gives you a list of relevant keywords and phrases to include into your pages content. It analyzes your content and shows you TF-IDF score (so you could think over using this or that word more or less often on your web page). Moreover, it provides you with the information about your 10 competitors, with the possibility to check how often they use the same keywords on their sites. Price: paid plans start at $50/mo. Sign up for a free plan here. SEMrush is comprehensive software for website monitoring and optimization. It comprises a bunch of SEO and PPC tools which help you tune your search marketing strategy. 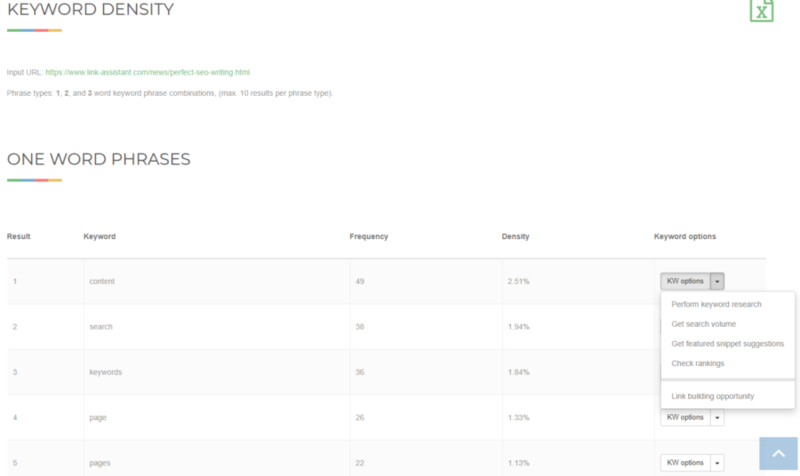 The term frequency-inverse document frequency algorithm built in its On-Page SEO Checker analyzes your existing pages, compares them with rival domains that rank higher in Google top 10 and comes up with suggestions on the use of your keywords. It also recommends related words and phrases that could increase your pages’ relevance. 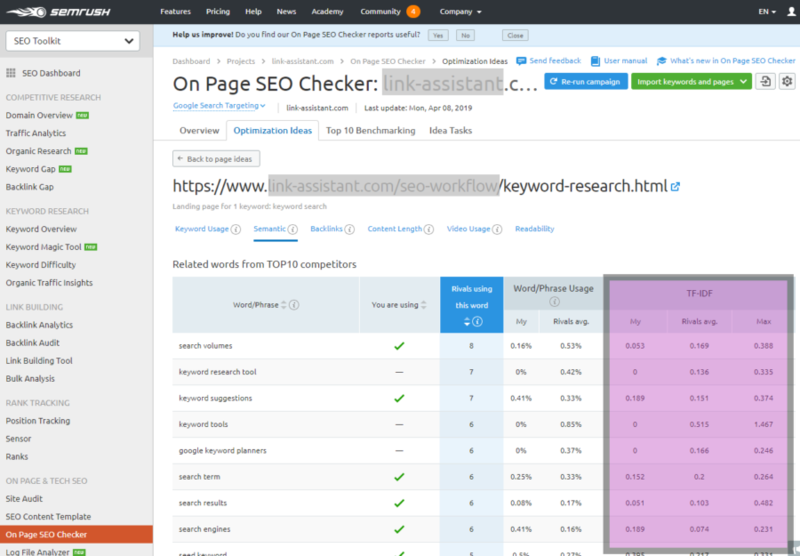 Moreover, there’s an SEO Writing Assistant available in your dashboard. It monitors and evaluates your text while you are creating it, giving you advice on the use of your chosen keywords and suggesting words and phrases to add to your content. Price: paid plans start at $99.95/mo. Sign up for a free plan here. SEOlyze is a tool designed for content and on-page optimization. Once registered, you get access to a set of content analysis instruments based on the built-in TF-IDF algorithm. The tool compares your page with the 10 best performing competitors for a chosen keyword and shows you results that include your keywords weight, as well as recommendations of what words to use more, and relevant keywords and phrases you should add to your pages to improve their performance. It also checks your text readability compared to your competitors’ pages. In addition, SEOlyze offers a Content Creation option that looks through your text and gives amelioration advice. Price: starts at $39.90/mo. Sign up for a free 30-day trial here. 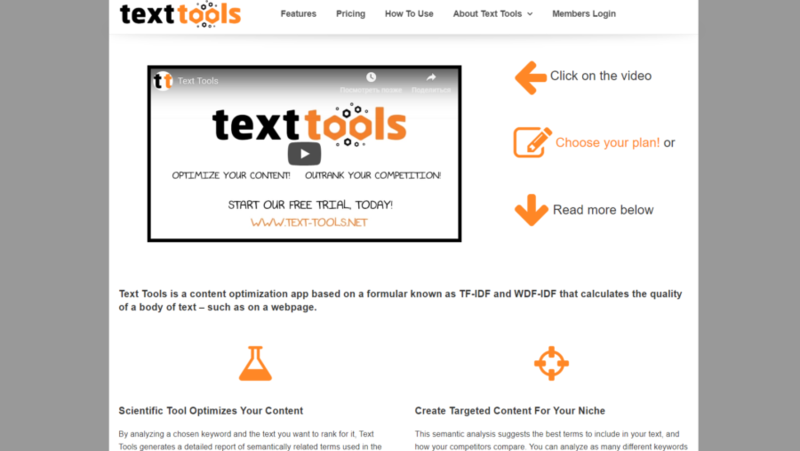 Text Tools is an app that effectuates content optimization, based on a TF-IDF algorithm. Given a target keyword, it looks through your content and comes up with semantically related terms you could use to make it more topically relevant. The keyword search is made across the top-ranking websites in search results for that keyword. Price: starts at $37/mo. A 3-day Pass is available for $9.97. 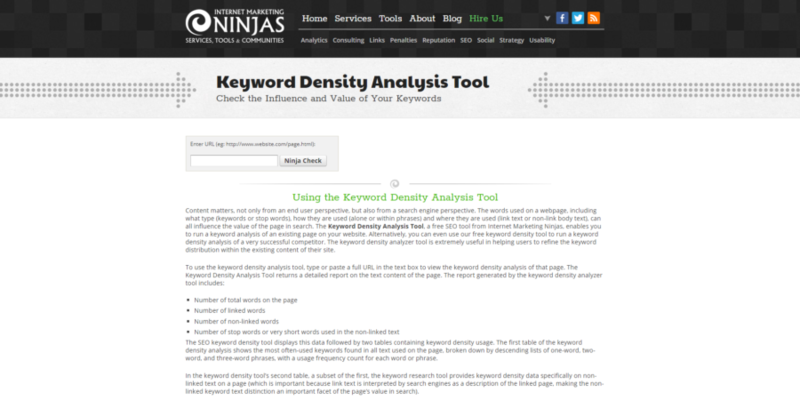 A simple keyword density checker by Internet Marketing Ninjas enables checking keyword density on a given web page. You may explore your website, as well as your competitors’ pages to learn how often they use the same keywords as you do and search for other related words or phrases you could possibly use to improve your relevance. GeoRanker is a set of SERP tracking and analytics tools meant to help small businesses plan their SEO strategies. GeoRanker Keyword Density tool measures the frequency of a key term appearance on a web page as compared to the total number of words on that web page. The tool examines a given page and reports on two key metrics. Density stands for how many times a word or phrase was used on the page. Word Weights shows how well the page is optimized for this or that keyword or phrase. Price: starts at $99/mo. Sign up for a free trial here. 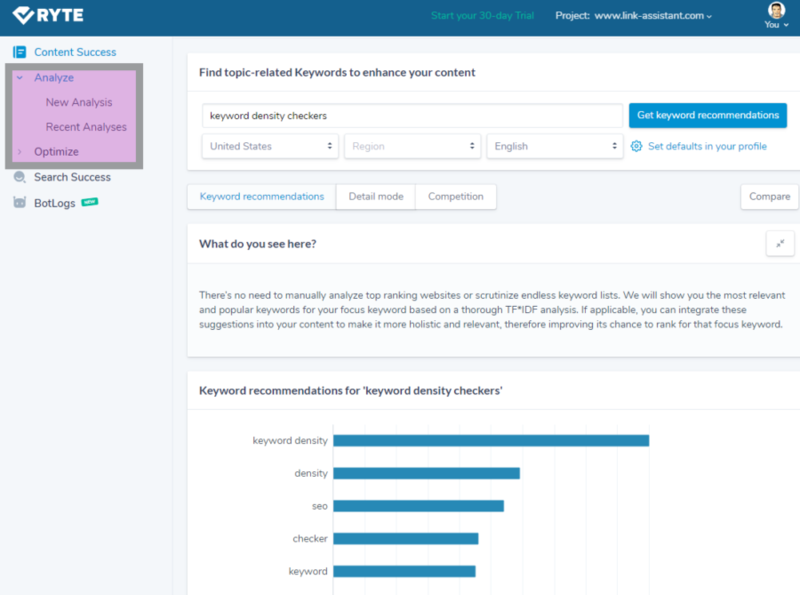 A separate Keyword Density tool is available for free. This keyword density checker by Visio Spark allows analyzing both existing webpages and texts you are working on. As a result, you’ll get a list of the 1, 2, 3, and 4-word phrases in your text with occurrences and density calculated. It also shows you the metadata of your webpage, as well as internal and external links. Appearing to be one of the simplest keyword density checkers, this app by SEO Review Tools comes along with some useful features. Apart from calculating your page’s or text’s keywords density, it offers a set of options. They include keyword research, search volume, featured snippet suggestions, rank checking, and link building opportunities. Thus, it alone can be the beginner’s instrument for content optimization. As you can see, there’s a variety of keyword density checkers and TF-IDF tools – simple and more complex – that can be made use of. After all, content is the most important part of any SEO strategy. In the strive for its quality, we can’t rely solely on keyword density checkers or event TF-IDF algorithms. However – whatever means necessary – they can be significantly helpful in the process of content creation, assessment and improvement.